Orchard Books, New York, 1993. 87 pages. I love Susan Patron’s Lucky books so much (The Higher Power of Lucky and Lucky Breaks), that I wanted to read her earlier book. 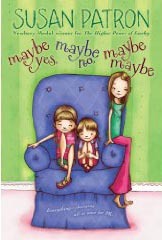 Maybe Yes, Maybe No, Maybe Maybe is a beginning chapter book that gently shows PK, a girl in between two sisters, dealing with big changes with grace. This story is not as deeply profound as the Lucky books, but you can see some of the same storytelling seeds. PK has some of the same quirky individuality as Lucky, which makes both girls seem true and alive. PK’s big sister Megan is almost a teenager, is Gifted, is getting hormones, and is changing in so many ways. She no longer comes to listen to the stories PK tells to her little sister Rabbit while Rabbit sits in the bathtub getting clean and wrinkled. PK finds the stories in the hamper where they’ve rubbed off people’s skin. But Mama says they need to move to a bigger place, a place that won’t have the built-in laundry hamper. How will PK find the stories? Even her friend Bike is upset. Based on Susan Patron’s Newbery acceptance speech, there’s a lot of her own story in this tale. Perhaps that’s what makes it feel so warm and genuine. A nice beginning chapter book about dealing with big changes with grace. This entry was posted on Saturday, June 20th, 2009 at 2:59 pm and is filed under Beginning Chapter Books, Children's Fiction Review, Contemporary. You can follow any responses to this entry through the RSS 2.0 feed. You can leave a response, or trackback from your own site.